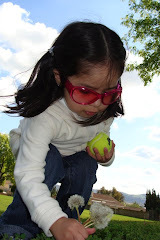 Our Montessori Chronicles: Home School Chronicle – Class time, then off to the Strawberry Patch we go. 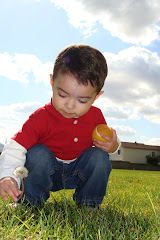 Home School Chronicle – Class time, then off to the Strawberry Patch we go. After an eventful weekend, the kids and I made it back to the classroom today. I brought some of February’s activities back out to the shelves and CC and RJ were immediately drawn to them. After Rug Time, both CC and RJ dashed to the shiny spooning-transfer activity below. Thankfully, RJ quickly found something else to work on when I reminded him that he had to choose an activity from his shelf first. You can tell from the picture that CC needs some brushing up on her spoon transferring skills. RJ is working on a foam puzzle that he struggled with just a few weeks ago, but now enjoys often. RJ then moved on to some hammering. But as soon as CC put the spooning-transfer activity back on the shelf he decided to give it a try. He did much better than I anticipated. The color sorting activity that CC is working on is the first Montessori inspired material I made. Except for the pom poms (which I purchased for $1), I used all recycled materials. It was made with the white box that packaged a case of water bottles, small apple sauce cups, and a larger container that used to hold rice pudding. CC enjoyed finding it on her shelf after not seeing it for over a month. 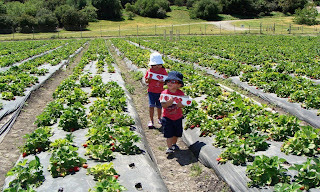 After today’s class session, the kids and I went to a local strawberry patch to pick some fresh delicious strawberries. 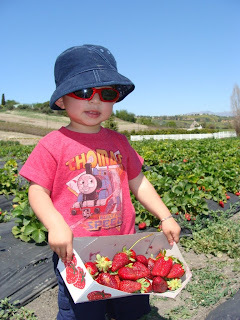 The last time we were there, RJ was much younger and didn’t do any strawberry picking, but today CC and RJ both had a great time filling their own containers. RJ is really advancing. CC seems to really enjoy last months activities. Thanks for the update luv. 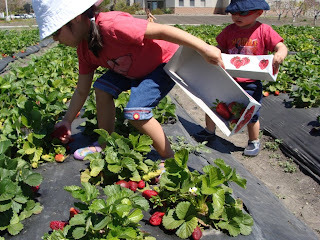 Please pick some more strawberrys too....yummmy! What a fun outing! It looks like Spring where you are! We don't have Spring quite yet :) Where did you get the tongs for the color sorting activity? I love how resourceful you are to re-use things for your activities. I have tried some of the other activites you posted and it went well. Thanks! Hi Tati, I don’t remember exactly where I purchased the tongs but I know it was either at ‘Dollar Tree’ or the ‘99cent only’ store. I got a pack of three plastic tongs for $1. I also sometimes use tongs from an ice bucket that I already had. I’m happy to read that you’ve tried some of the activities at your home and it’s going well.